Poké is a raw fish salad served as an appetizer in Hawaiian cuisine. 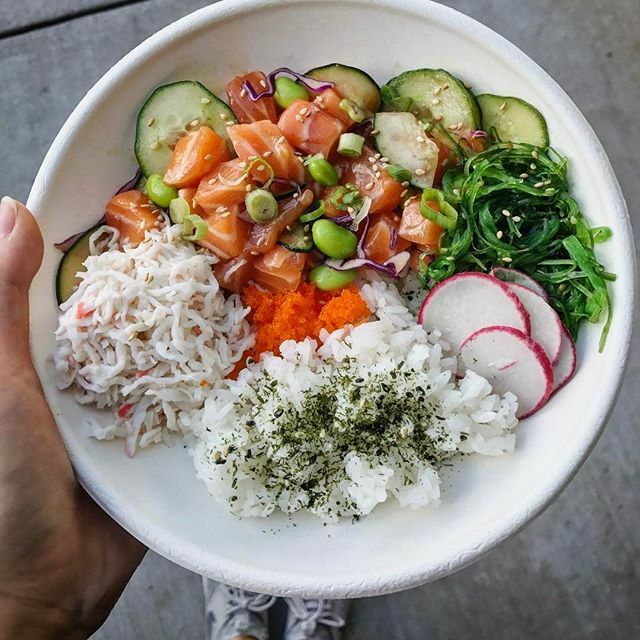 Poké is the Hawaiian verb for "section" or "to slice or cut". Ahi poke is made with yellowfin tuna. The modern poke typically consists of cubed raw ʻahi (yellowfin tuna). The traditional Hawaiian poke consists of fish that has been gutted, skinned, and deboned. It is sliced across the backbone as fillet, then served with traditional condiments such as sea salt, candlenut, seaweed, and limu. The present form of poke became popular around the 1970s. It used skinned, deboned, and filleted raw fish served with wasabi and soy sauce. Newnan -- Coming Soon ! to celebration in exciting new ways. Tuna, Spicy Tuna, Salmon, Albacore, Octopus, Shrimp, Scallop, Baked Chicken, Tofu. Sweet onion, Red onion, Lettuce, Cucumber, Carrots, Edamame, Cilantro, Kale, Red cabbage . Original ginger shoyu, Gluten free ginger shoyu (+$1.00), Spicy mayo, Wasabi shoyu, Ponzu, Sweet chili, Wasabi mayo. Seaweed salad, Crabmeat salad, Jalapeños, Spring onion, Ginger, Masago, Wasabi, Sprouts, Red radish, Pineapple, Sweet corn, Avocado (+$1.00), Sesame oil, Gochoogang. The Classic --- Tuna, lettuce, sweet onion, cucumber, masago, sesame seeds, sesame oil, hawaiian salt, the original and ginger shoyu sauce. Waikiki --- Salmon, lettuce, red onion, kale, crabmeat, masago, carrot, red cabbage, sesame oil, furikake, tempura flakes, original and spicy mayo sauce. Volcano --- Albacore, lettuce, sweet onion, Jalapeño, cilantro, masago, sesame oil, wasabi, roast garlic, original and wasabi mayo sauce. Kona --- Tuna, salmon, lettuce, red onion, cucumber, crabmeat, masago, cilantro, kale, red cabbage, sesame oil, ponzu and sweet chili sauce. All Poké Burritos are wrapped with Roasted Seaweed and White Rice. You may remove ingredients, but You may not add. The City - Sambazon Açai berry, Blueberry, Strawberry, Banana, with Coconut water. Very Berry Blaster - Sambazon Açai berry, Blueberry, Raspberry, Blackberry, Banana, with Orange juice. Tropical - Sambazon Açai berry, Pineapple, Mango, with Apple juice. Newnan — Now Open !